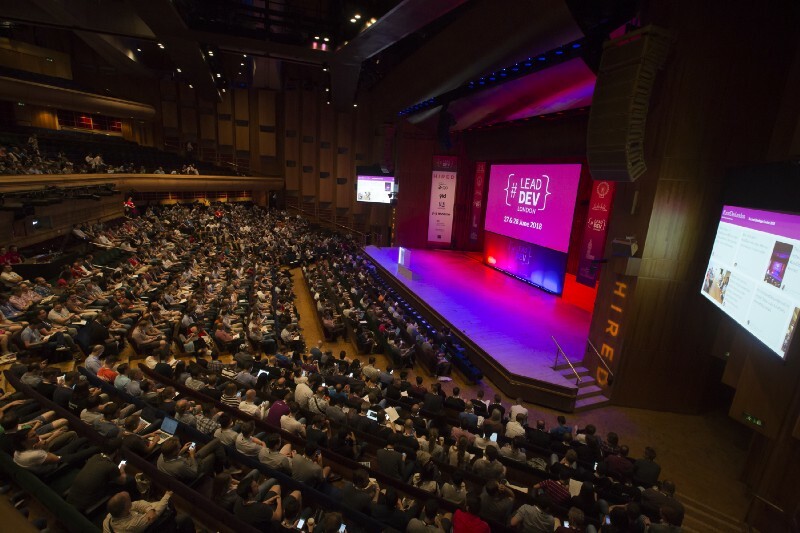 Last week, set against the glorious, brutalist backdrop of the Barbican conference Centre, the 7th Lead Developer Conference took place. Welcoming over 1000 tech industry folk for two days of insightful talks. 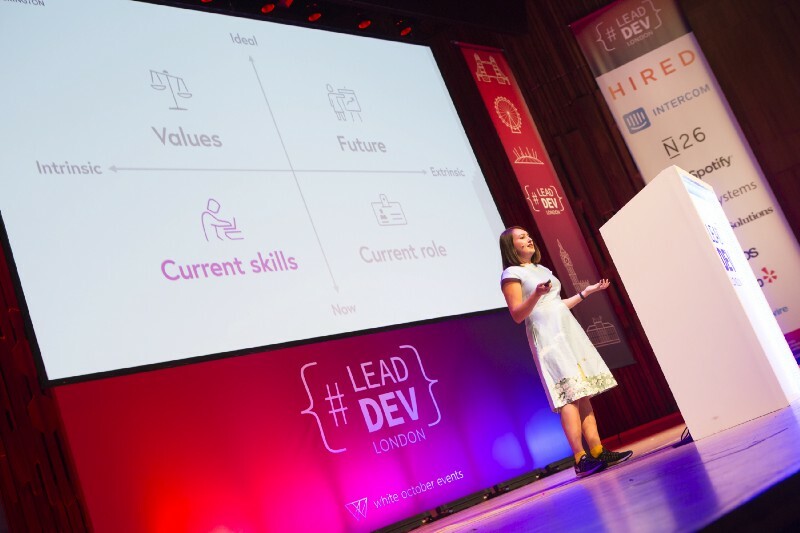 Organised by our sister company White October Events, Lead Dev has become a favourite on the White October calendar because, whatever your role in the tech industry, the talks are super relevant and always full of more take-homes than you can fill a Moleskine with. This year our entire White October team were lucky enough to attend both days of the conference, something we’ll be sure to repeat next year. Make sure you get recognition for good performance. Get comfortable ‘telling and showing’ people your work (self promotion doesn’t always come naturally but it’s a key tool in getting ahead). Have confidence and practice feeling powerful! He referenced Amy Cuddle’s TED talk about power poses. Changing our physicality can help us feel more confident. So, it’s not just mind over body, but body over mind! Christian McCarrick tells managers how to get scale themselves. Say ‘no’ to almost everything without feeling guilty — he referenced Essentialism — By Greg McKeown. Get honest feedback from employees — feedback seeking behaviour equals higher job satisfaction. Practice calendar blocking. Free up space for more energy and the ability to concentrate on a single task at a time. Delegation — ’Let it go! Learn to scale your teams’. In the tech industry, we are ‘in the knowledge economy’. Its therefore paramount that we look after our mental health and wellbeing. The benefits of exercise should not be underestimated. Block out time to keep active and meditate for at least 2–5 minutes per day. Another key outtake was to accept you’ll have bad days. It’s human nature to suffer from imposter syndrome from time to time so be easy on yourself. As a designer myself I love seeing how Design Thinking can be applied to different business processes. Crystal gave a really insightful talk on how her organisation have applied Design Thinking to improve and iterate on their hiring process. How might we… improve the interview experience? Getting the new hires to be the UX designers by interviewing each other to get feedback on the process and uncover pain points. Experience mapping; Exploring the various touchpoints experienced by the candidates from initial contact with the organisation through to the on-boarding process. Prototype and test; Participants were introduced to the concept of paper prototyping and asked to propose improvements to the experience flow by sketching, writing scripts and example emails, trying to focus on the pain points..
Ship and iterate; Here the focus was on stakeholder management by involving HR managers in the output and review process. Crystal highlighted this part as being crucial to the change process. Having the decision makers in the room during sprint reviews and feedback is what helps drive the change. 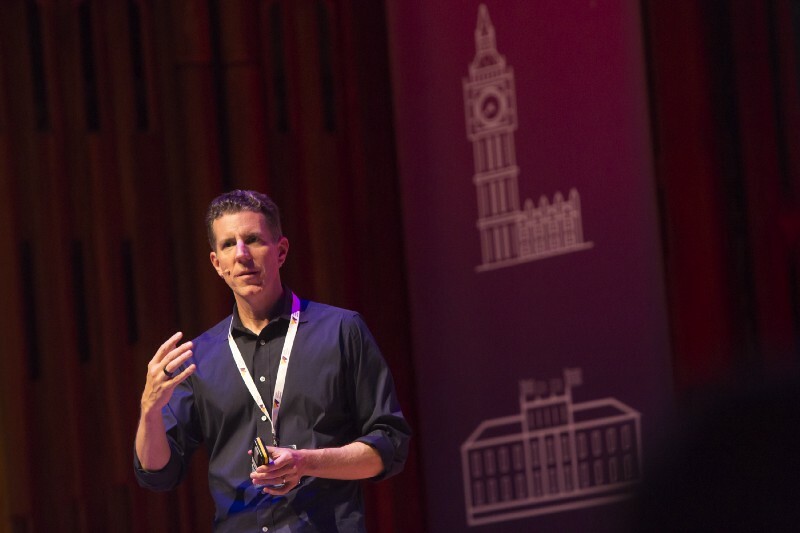 Not only were there a tonne of takeaways for managers and recruiters but this talk hopefully highlighted to non-designers how useful Design Thinking can be in helping improve any business process. Setting realistic and meaningful goals for team members without the fluff is an ongoing challenge for managers. 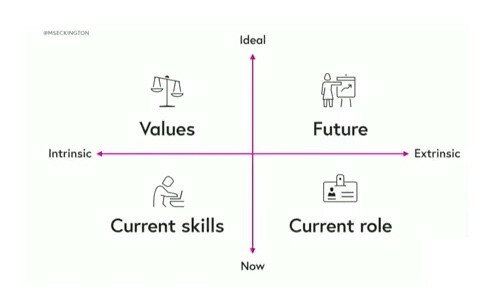 Melinda’s goal setting framework struck a chord; using a matrix of four measurables to get to the crux of what could and should be an individual’s career goals. ‘Generate as many thoughts and ideas as possible’ to get the best out of this exercise. I’ve always found exercises like this extremely helpful in a life coaching setting, so applying them to career makes a lot of sense. What is your purpose, passion and motivation? Imagine you’re retiring and looking back on your career. What would you want it to look like? What does work/life balance look like? Anti goals — what don’t you like? Which of your abilities and values are you able to use in your role? What would you miss if you left your role? What kinds of people do you enjoy working with and what type of environments inspire you? This stage gets people to reflect inwards. What are their strengths and weaknesses? What do you do better than others or what do others see as your strengths? Is there a gap in your knowledge or experience? What skills can you develop? Think about technical or leadership skills you might be interested in developing. This is a great opportunity to reflect on the wide array of skills and experience you have gathered during your career so far. Chances are you’ll be able to give yourself a pat on the back about how far you’ve come. But more importantly this is the time to look at where the skill gaps lie. Melinda suggested looking at job descriptions you’d hope to apply to in the future and noting down your current skills against any experience or knowledge you’d need to acquire before applying. This is an exercise I’ve found very useful in my own skills gap analysis. I can’t finish this blog without mentioning the first day’s closing talk by Nickolas Means. A superb storyteller, Nickolas built his narrative with layer upon layer of detail, some of which I admit was so technical it went right over my non-developer head. But that’s not the point. The ultimate aim of this tale of nuclear mishap was to show us that when things go wrong, whether its a mistake in the workplace or a nuclear disaster, pointing the finger at individuals is a fool’s errand. “No-one comes to work expecting or hoping to do a bad job”. When they make a bad decision or have missed something, there is a good reason why they did what they did. And it will most likely happen again if the root of the problem is not fixed. So that just about wraps it up. A big thank you to White October Events, another cracking Lead Dev event. Filled with sunshine, a diverse and inclusive speaker line-up, and with take-homes for everyone — even the less technical or management-minded of us. If you missed out on this one, you can catch it next year in Austin, New York or London. Alternatively, check out one of the other events the White October Events team put on throughout the year including their new Lead Dev Community Meet ups. 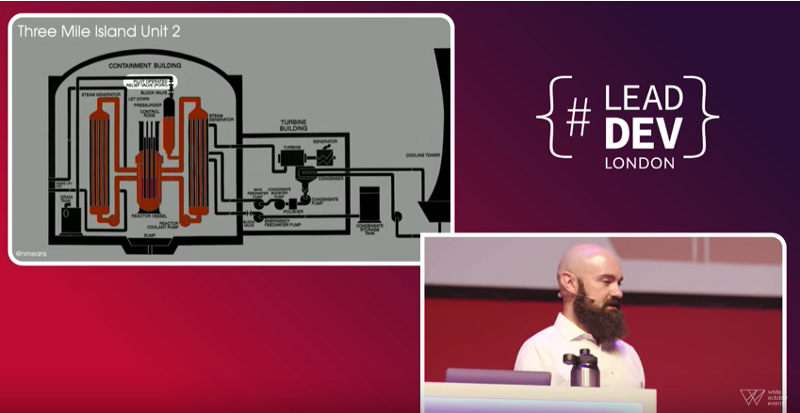 And finally, if you’re hungry for more Lead Dev 2018, you watch all of the talks on the YouTube channel here.